the victory of a revolution is immanent and consists in the new bonds it installs between people, even if these bonds last no longer than the revolution’s fused material and quickly give way to division and betrayal. Even if Artaud did not succeed for himself, it is certain that through him something has succeeded for us all. Tahrir, Spain, Occupy, Bahrain, Syria…or even Spain in the 1930s, Hungary in 1956, Tienanmen, Iran in 2009…it seems the question we should never forget to ask is: in what way, through the many who made these events happen, has something succeeded for us all? I agree with the organizers when they call for detailed empirical analyses of local politics. But before we rush off and get started, I want to ask what we would be looking for out there. And I want to suggest a provisional answer to that question, which is that we should be looking for our own will to govern ourselves. This will is always present, but it is often hard to see, and it is always engaged in a struggle with another will, our will to be governed. For a long time decisions have been made for us, without consulting us. We…have come to Syntagma Square… because we know that the solutions to our problems can only be provided by us. We call all residents of Athens…and all of society to fill the public squares and to take their lives into their own hands. In these public squares we will shape our claims and our demands together. For many Spanish in that same year, it was que se vayan todos (get rid of them all) and no nos representan (they do not represent us). Not a cry to replace one set of rulers with another. But an outcry against the whole architecture of rule. I think if we use this lens in our search for local politics, if we search for the will to govern ourselves, it will offer us at least one very important benefit: it will allow us to see beyond the many extortions that we are currently subjected to, that currently frame our politics, that reduce the options available to us and render contemporary local politics virtually apolitical. What are these extortions, and how might the will to govern ourselves help? One extortion perhaps most familiar to those in the U.S. and Northern Europe is this: if you don’t want neoliberal localization, devolution, and privatization you have to accept a strong national redistributive state. More generally, it says if you don’t want neoliberalism, you have to accept a welfare state. Here the will to govern ourselves rejects both options as starkly oligarchical and searches for a democracy beyond. A related extortion says if you don’t like capitalist markets you have to accept a state command economy. Our will not to be governed is searching here for something beyond, something like Eugene Holland’s free-market communism. Or on the Left, we are often subjected to this: if we don’t accept a strong party leadership the neoliberals will have their way. Here anarchists, radical democrats, autonomist Marxists, and people in the new social movements have been searching for something beyond. In Southern Europe, they know only too well this extortion: if you don’t want utter financial collapse, you must accept austerity. Que se vayan todos. In Tunisia, Egypt, Syria, Bahrain, Iran, Libya, and other places, they faced a more stark and cynical extortion: if you don’t want the entire society to descend into violent chaos, you have to accept the rule of an autocrat. This is the old Hobbesian extortion: bellum omnium contra omnes or Leviathan? The devil or the deep blue sea? 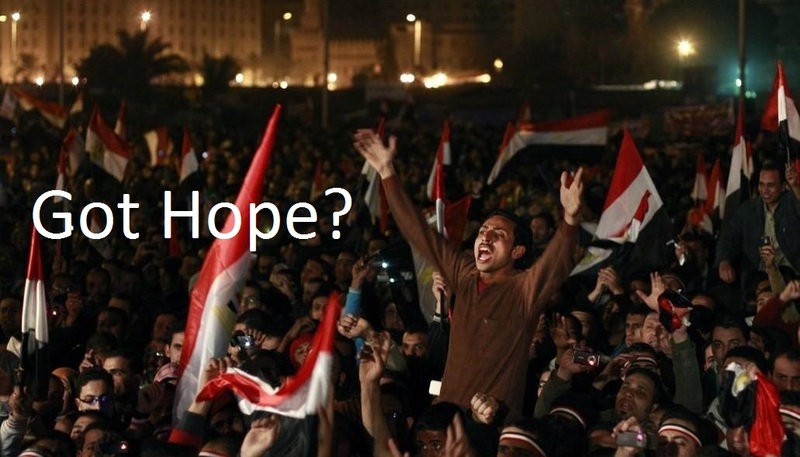 In Tunisia and Egypt people responded: we’ll take our chances in the deep blue sea. If we are to overcome these extortions, I think, we must do something that takes tremendous courage and creativity: adopt a politics of refusal. We need to adopt, with the Spanish, Bartleby’s motto: “I would prefer not to.” We need to say no to such extortions. But, perhaps counter-intuitively, this saying no is not a negative act. It is a positive one. Saying no is a declaration that we intend to search for a way forward. It is an attempt to push through and find out what happens next, to discover what we are capable of building instead. So, in thinking about the empirical investigations we might undertake, I think we should seek out the Bartlebys, seek out those who have already found the courage to refuse extortion, of whatever kind, find those who have been confronted with the abyss and not been cowed. We should look for those who have been exploring what possibilities there are beyond welfare-state-or-neoliberalism, beyond austerity-or-collapse, beyond leviathan-or-chaos. How did they summon the courage to say no? Did they organize their refusal? How? What consequences did they face? What new lands did they discover in the wake of their refusal? What lies beyond, in the deep blue sea? In Spain, for example, what comes next after indignation and revolution? What kind of politics, and actions, and activities, and initiatives, and moods, and feelings, and forms of life are emerging in the wake of their historic awakening and their declaration that they intend to begin governing themselves? What new tendrils, new connections, new intensities, new paths, new strengths, new escapes are emerging? Are those new forces finding each other? Are they connecting? How? What can we learn from their example? To what extent is a new common, a new non-State republic, a new democracy emerging? My sense is that in the study of local politics today our lips dripping with the words of neoliberalism, austerity, and oligarchy. Far fewer voices are singing the emergence of constitutent power, of potentia, of puissance. This is one voice, from Puerta del Sol, saying “the revolution was in our hearts but now it flies free in the streets.” My sense is that we are not yet obsessed with such voices, with the continual re-emergence, all over the world, of the will to govern ourselves. But we should be. We are experiencing an incredibly intense burst of the continual, insistent, and joyous desire for democracy. And we should be rapt in our attention. I just saw Joel Beinin give a talk here at the University of Washington on the Egyptian uprising. One of his main points was that the events of 2011 did not come out of nowhere, but rather were heir to a long series of popular struggles in Egypt. While Beinin acknowledged the importance of the middle classes (liberals, professionals, intellectuals, etc. ), students, and tech-savvy young people, he was keen to highlight the importance of workers’ struggles. He argued that over the last twenty years there have been thousands of strikes and other actions by Egyptian workers, most of which were not organized (and often even opposed) by the official unions and their leadership. The strikes were typically wildcat strikes, spontaneous and organized by a grassroots leadership (often led by an elected, ad hoc strike committee). Beinin was good in that while he wanted to emphasize workers’ activism, he didn’t make the tired old-Left argument that “only the working class” can be the agent of history, that the Arab spring is reducible to workers’ struggles against neoliberalism, and that those workers’ must organize into a party to seize the state. However, he also didn’t seem to see much potential in Egypt for such grassroots worker activism in the long term, since, he said, each action was highly localized and unable to see beyond the walls of its own factory. I am not quite sure his pessimism is warranted, given the remarkable energy and courage the workers showed. In any case, there seem to be multiple resonances with the long history of self-generated and -managed workers’ struggles (e.g. Spain, Italy, Russia, Germany, Poland, Hungary…), struggles that concerned themselves not only with wages and working conditions, but also with the development of democracy: they insisted on workers’ capacity to control and manage economic production for themselves, without managers and without capitalists. At the very least, I think the workers’ struggle is an element of the Egyptian uprising that should get more attention than it has. I have an audio recording of the talk. If you are interested email me and I can send it on. It seems clear at this point that 2011 will be remembered as an extraordinary year for political action, and maybe even for democracy. Probably all of us were inspired by the Arab Spring, and perhaps most also by the ongoing struggles in Syria, Spain, Greece, the UK, Chile, and Portugal, to name a few. We all hope for democracy rather than autocracy. There is no question that the regimes in Tunisia, Egypt, Libya, and Syria were (or are) tyrannical, mendacious, and dehumanizing. We know what we are against. But what occupies me is whether we are clear yet about what we are for. What is this democracy we all want? I am worried that we think of democracy as something quite a lot less than it is—or has the potential to be. I have been struck by how consistently U.S. officials, especially Obama and Clinton, have spoken in terms of a “transition to democracy” taking place in Egypt, Tunisia, and perhaps now Libya. I think this idea of a transition is revealing because it shows the way democracy is dominantly conceived—it is thought of as a State governed by principles of liberal democracy. When Obama and Clinton speak of a transition to democracy, they are expressing a desire that other places will become more like us, that they will cross out of their current turbulence and into the safe harbor of a democracy-like-ours. But liberal democracy as it is practiced in the U.S. (and the UK, and Germany, and France, etc.) is an extremely impoverished form of democracy. It prides itself on representative government, free elections, two parties, and the rule of law. It is a system whereby a few elected representatives govern the mass of people. It is in fact an oligarchy. The few ruling the many. What the Tunisians and Egyptians showed us this winter, what actually existed in Tunis, Tahrir Square, Pearl Square, and Dara’a, if only for a brief time, really was democracy. The many ruling and speaking for themselves. Their extraordinary acts showed us that democracy doesn’t have representative government. It does not hold elections, and it does not have leaders. There are no parties, no state, no laws, no corporations, no church. It does not set aside a few to rule the many. Democracy is disorderly, cacophonous, and kaleidoscopic. It is a million different voices and as many demands. It cannot stand still, or be formed up into governing institutions. It does not take orders, it will not be dominated, and it cannot be killed. It is the most powerful thing there is; it is also extremely fragile. It is already here, inside all of us. It is, as Douglas Lummis once wrote, the power of the people, all the people, gathered together in the public square, with no state or god standing over them. Only the empty sky. The apologists of liberal democracy, of democracy-like-ours, cry utopia. If that’s democracy, they object, it is impossible. But they’re wrong. It isn’t impossible. It’s just really scary. Scary not to know what might happen when we take control again of our own lives, when we stand together in the square with no one taking care of us, no few to tell us many what to do. Democracy is perfectly possible, because we’ve achieved it repeatedly throughout history. Tahrir Square is only our most recent success. But that success is threatened by this idea that Tahrir was somehow a proto-democracy, an immature outburst in need of an orderly transition, a growing-up so it can become stable, become a democracy-like-ours. Rather it is our ‘democracy’ that is immature, that needs to grow up. What we need, I think, is to come to understand ourselves as living in an oligarchy, as a many subject to the rule of a few. Then we must undertake the hard work of growing up: of letting go of our need to be ruled and refusing the security of having someone else govern us. If we really want democracy, if we are truly ready to learn what the Arab Spring has to teach us, we need to learn how to go to Tahrir Square, all of us together, over and over again. It is scary, to be sure. It is also very hard. But it is probably our only hope.